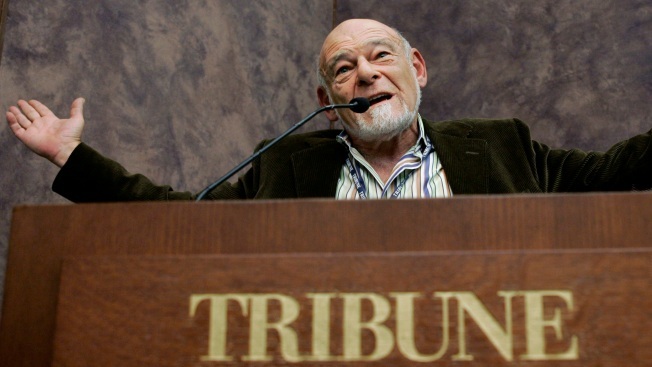 Zell Calls Tribune Purchase "A Mistake"
Real estate billionaire Sam Zell comments on his purchase of the Tribune Company during a news conference at the Tribune Tower in Chicago, Thursday, Dec. 20, 2007. The Tribune Company's Sam Zell on Wednesday said he did not anticipate the recent steep decline in the newspaper business and called his acquisition of the nation's second largest newspaper publisher "a mistake." Zell made the remarks during an interview with Bloomberg Television. "The definition if you bought something and it’s now worth a great deal less, you made a mistake," Zell said. "And I’m more than willing to say that I made a mistake. I was too optimistic in terms of the newspaper’s ability to preserve its position." Zell completed a $8.2 billion buyout of the company in December 2007, taking the ailing newspaper and TV company private. A year later, with a $13 billion debt load, Tribune filed for bankruptcy. The Chicago Cubs and Wrigley Field are not a part of the Chapter 11 filing. "It's very obvious that the newspaper model in its current form does not work and the sooner we all acknowledge that the better," Zell said. "Whether it be home delivery, whether it be giving content away for free -- these are critical issues. "We are seriously looking at everything because in effect the future of the newspaper industry is at risk today," he said, when pressed on the possibility of cutting back on delivery and print in favor of a greater role for digital publication. Zell said a merger of Tribune with another company is unlikely, given that commercial real estate values are down about 30 percent. "That’s like asking someone in another business if they want to get vaccinated with a live virus," Zell said. "There’s not a long list of people who want to buy newspaper companies today." Tribune Co. properties include the Chicago Tribune, Los Angeles Times, South Florida Sun-Sentinel as well as Chicago magazine, WGN-TV and WGN-AM.